There’s no denying that families today are busier than ever before. Having to juggle work, school, extracurriculars, and the occasional special event means that most moms have to wear multiple hats, from cook and chauffeur to nurse and referee – plus everything in between! However, there’s one hat you shouldn’t have to wear just because you’re a mother – that of an orthodontist. While your instincts and attention to detail come in handy for crafting the perfect family calendar, your child’s oral health requires expert advice and guidance. That’s where Team Demas Orthodontics comes in! Many people believe that orthodontics is about straightening smiles and not much else. This is a common misconception, but in reality, orthodontic treatment addresses much more! Because straight teeth aren’t the only indicator of a healthy smile, orthodontics focuses on the diagnosis, prevention, and correction of malpositioned teeth and jaws. Orthodontists like Dr. Demas know to go beyond the surface of a smile to examine not only a patient’s teeth, but the movement and growth of their jaw as well. They’re also able to observe the teeth as they develop. This allows them to check for any impacted, missing, or overcrowded teeth that may otherwise go unnoticed until they begin causing problems. 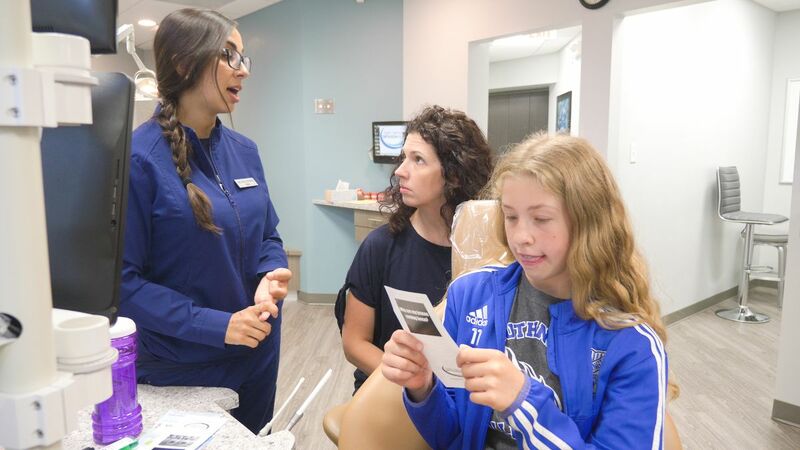 Orthodontics is most often associated with teens, so it can come as a surprise to learn that the American Association of Orthodontists recommends kids have their first orthodontic exam by about age 7. Even though their mouths are still developing, and they generally have a mix of baby and permanent teeth to deal with, it turns out that’s actually the point! Seeing children around this age means we can pick up on potential problems before they become a big deal. This can lessen or eliminate any negative impact on your child’s permanent teeth and bite. We treat many young patients here at Team Demas Orthodontics, and have seen firsthand the positive difference preventive care makes. Starting treatment at the right time can make a positive difference in a child’s oral health, and even though children won’t require any active treatment, an early exam lets us check for a number of issues to determine if and when orthodontic treatment is indicated. Depending on the type of treatment, most patients will need to be seen every 6-8 weeks or so throughout the orthodontic process. Since you’ll be spending quite a bit of time there with your child, it’s important to find an office you feel comfortable with! 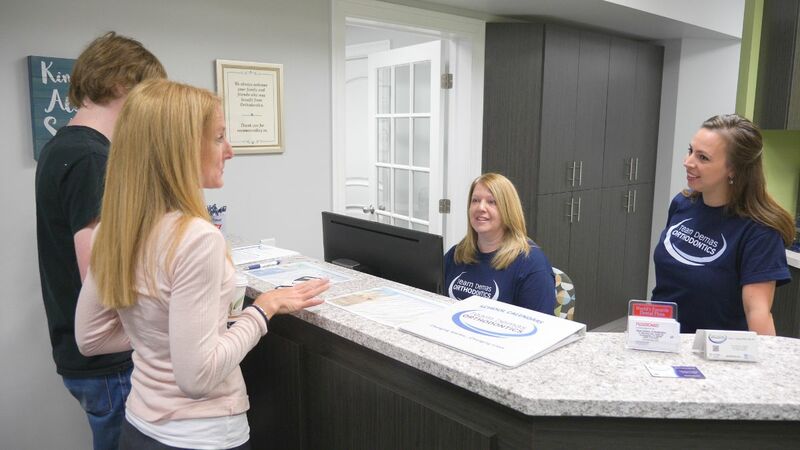 Our beautiful Southington office is bright, relaxing, and state-of-the-art, so you can be sure you’re getting the most efficient treatment possible along with the best results. For your convenience, we offer morning, afternoon, and Saturday appointments to accommodate your busy schedule. We’re also conveniently located so you can get back to work, school, or home as soon as possible after your child’s appointment. Our whole team is committed to creating a warm, welcoming environment and a positive, stress-free experience from your first appointment with us to your last! Modern orthodontics have come a long way in recent years. At Team Demas Orthodontics, we combine innovative technology with cutting-edge techniques to help patients of all ages achieve a straighter, healthier smile. We offer the following treatments from our Southington office. Metal braces are typically composed of stainless steel brackets, wires, and bands that work together to gently guide the teeth into the desired positions over time. Today’s braces are smaller, lighter, and more comfortable than previous versions. They can also be personalized by choosing elastics in a wide variety of fun color combinations. Traditional metal braces tend to be the most widely used orthodontic treatment, and with good reason! They are a reliable, effective, and economical option for straightening smiles and improving oral health. Metal braces are especially useful for cases that are more severe or complicated. Ceramic braces are also referred to as clear braces, tooth-colored braces, or esthetic braces, and they work the same way that metal braces do. While they utilize the same components as traditional braces, the brackets on the front side of the teeth are made of a translucent ceramic material that blends in with the natural color of your teeth. When paired with clear, white, or tooth-colored elastics and ties, ceramic braces can offer patients an incredibly inconspicuous treatment option! While ceramic braces are tough like metal braces, they are more prone to chipping and cracking. For this reason, we generally only recommend them for older teens and adults. Instead of brackets and wires, the Invisalign system uses a series of clear, customized aligners that are nearly invisible and completely removable. The aligners are composed of a soft but strong thermoplastic resin designed to fit snugly over the patient’s teeth, which helps to avoid much of the friction and abrasions that braces can cause. As the teeth begin to shift, the aligners will be changed out approximately every 1-2 weeks to keep up with this movement. Unlike braces, which are a fixed appliance and cannot be removed, Invisalign relies almost entirely on patient compliance to work properly. Aligners must be worn 20-22 hours every day, throughout the course of treatment, in order to get results. The Invisalign system tends to work best for mild to moderate orthodontic issues, so it may not always be a suitable choice for patients who have more severe or complicated cases. When it comes to treatment times, there is no “one size fits all” answer. This is because every patient has their own unique smile, and will respond to treatment in their own way. The length of time your child will require treatment will vary based on their own specific case, with factors such as the severity of the problem, the health of their teeth, gums, and supporting bone, and how compliant they are playing a part. We can tell you, however, that on average, braces tend to be worn for about 12 to 24 months, while Invisalign treatment averages about 12 to 18 months. As a mom, we know that you want nothing but the best for your child, and that includes a beautiful, healthy smile that will last them a lifetime! If you’re in Southington or the surrounding communities and want to explore more about orthodontics for your child, get in touch today to schedule a FREE exam! We’d love to meet you both, and are excited to get your child started on the road to improved oral health and a smile they’ll want to share with the world.